Getting started on this journal has been far more difficult than I had expected. Three days out and I am just beginning, finally inspired by last night’s first performance and the preparations for it, which took most of the day. We are all tired, me from 3 weeks work in the garden and a long and late-night weekend stint photographing a little music festival not far from St Lormel. The Palestinians are tired from their journey here: they had left Aida late in the afternoon of the 14th for the 3-hour bus ride into Jordan (the airport in Tel Aviv, just an hour away from Aida is closed to Palestinians), took a flighty which left at 1:30 in the morning, and landed in Paris at 5:30. When we finally reached their resting point in Paris it was 7:30. Seven hours later, after lunch, we were in the bus and on the first leg of the tour, the short (30km) ride to the Paris suburb of Juvisy. 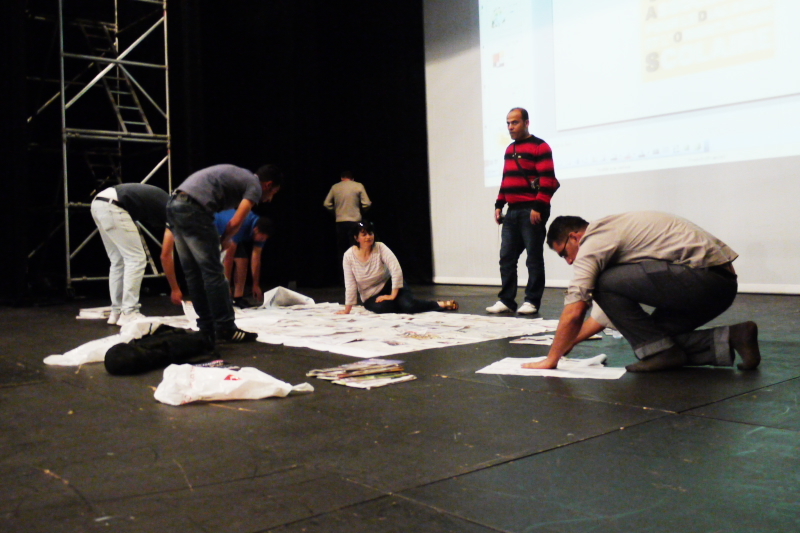 The troupe immediately set to work casing out the joint, laying out their equipment and appropriating the tables, chairs and bits & pieces, which they would transform into a representation of their Palestinian world; the play Handala by AbdelFattah Abu-Srour, the founder and director of the Al Rowwad Theatre Company. 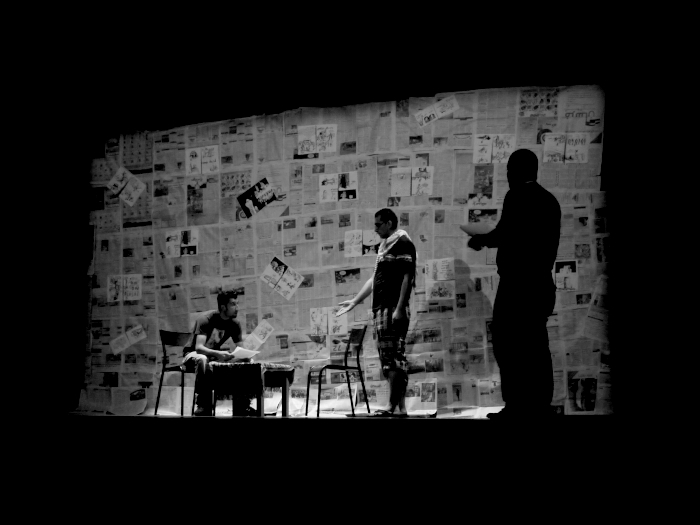 The play is based on the character, Handala, created by the cartoonist and social critic Naji Al-Ali. Magic is the only way to describe this transformation, and I guess that is what makes theater, theater. The performance went off with hardly a hitch. It is hard to believe that 36 hours before, the troupe was just getting off the plane. This is also the magic of theater, or at least of those who do theater. But there is more to it than that with these people. For their lives are lived as theater. 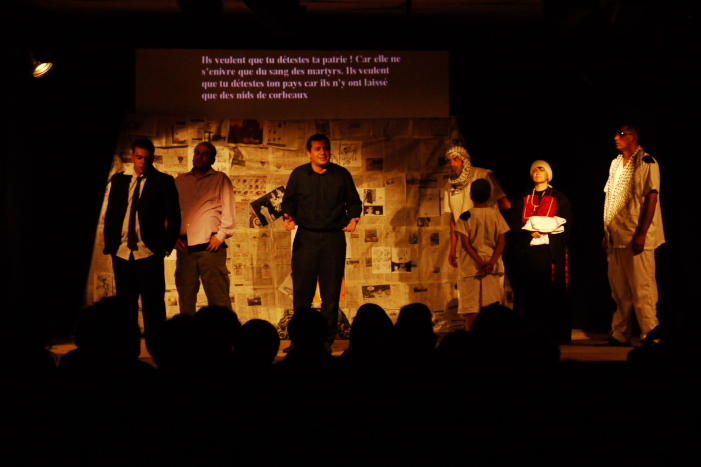 As if they lived in a play, they are in a real life false situation, forced to carry out the tasks of everyday life in a theater of war and occupation. If theater gives the actors and actresses roles that they must play, so does the conflict in Palestine assign roles to those who live there. Palestinians who live in the refugee camps are given the most false and complex roles of all: that of the exile in her/his own land. Palestinians in the camps are considered to be people without a land, but the camps they live in have been built on Palestinian land, often within sight of ancestral family property. How to live such an impossible reality? How to be at once in and out, legal and illegal, citizen and “nationality unknown,” at home and homeless? 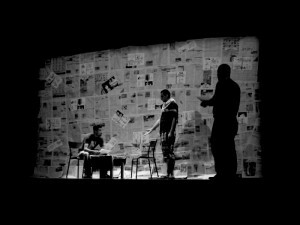 The only solution is to see one’s life as a theater piece, to be played as if one were constantly on stage, a real person playing an unreal person. Life as total preparation for theater; no wonder these people are so good at it. In Juvisy, the hall, the technical equipment and the technicians were all highly professional. We were, in fact, in a real theater supported by the city and regional council. 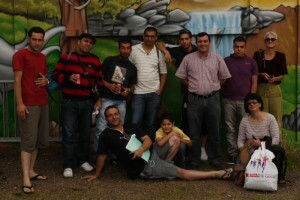 Here, in Nevers we are in a community social center, and things are much different. Everything is done on a shoestring, the public funding being at a bare minimum. The space is not primarily a theater, so the lighting and sound equipment have been rented especially for the occasion, and the technician is not familiar with it. The stage is tiny compared to yesterday’s: there is no backstage or curtain, and so no place to change or to move between exit and entrance places. But I have no doubt that the troupe will adapt, as they always do in their real lives, and in the theater, to the unexpected, which, in fact is expected and is expected to be worse, and not better than expected. Three hours later and the miracle has happened again, this time to a standing ovation from a small (80) and enthusiastic (and admittedly partisan) crowd. After a delicious and copious buffet prepared by a group of dedicated local activists, we all headed off to the homes of our respective hosts for a long night’s sleep and our first relaxing morning; we don’t hit the road until 10:45. They are setting up in one of those social/cultural centers, which can be found throughout France. In general, it is the local municipality which funds them, with additional funds coming from the myriad of local and national social service agencies, the Ministries of Culture and of Sports, and regional councils. They are more often than not found in the cités or ghettos, constructed by the left in attempts to aid impoverished areas or by the right in attempts to keep them from exploding. In either case, things have not worked very well, in spite of many benefits to the local population, due more to the inspired efforts of idealistic social workers than to any coordinated intention on the part of the political class or the state. Their functioning is squarely in the French tradition of centralized top down authority, and the programs are mostly imposed on a hapless and indifferent population. 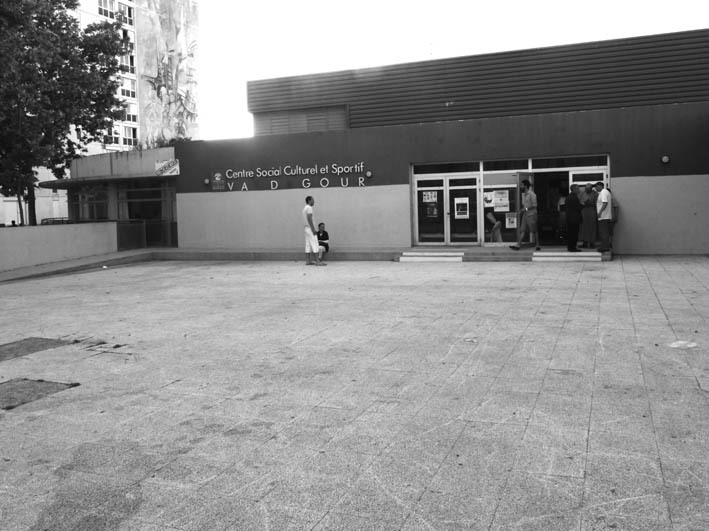 The overall result is clearly visible in the run down condition of most of these centers, in the absence of life in and around them and in the demoralized staff which functions in them in decreasing numbers, as the Sarkozy government shifts priorities from education and prevention to punishment. But even in its slightly dilapidated and underused state, the Centre socio culturel et sportif Valdegour where tonight’s performance will be held, is impressive in its size and its remaining equipment. The lighting and sound material is more than adequate; the modest stage has wings, a back stage, descending screen and curtains. More than necessary for the troupe to do its thing. Everybody is relaxed. 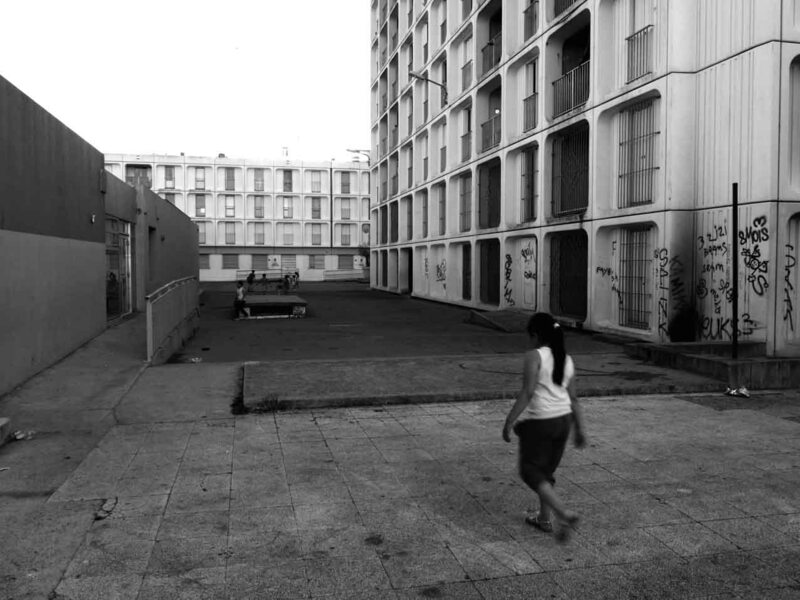 In France, the ghetto areas are found not in the city centers, but on the outskirts of, if not actually outside of the city limits. These zones are mostly neighborhoods constructed in 60s and 70s when foreign labor (mostly North African) was recruited to work in the factories during the “trente glorieuses” (thirty glorious post war years when French industry flourished). Low cost rental apartments were constructed in low-rise complexes ranging in size from 3 or 4 buildings on a hill to dozens, which in and of themselves constituted a new town. In the beginning there was a sense of neighborhood and of pride, but as economic conditions worsened and as the French social fabric began to dissolve, these areas became concentrations of unemployed “foreigners” (even though they were housing second and third generations born in France). Valdegour and the cite which surrounds it, up in the hills north of the center of Nimes is a perfect example of the results of this process of degeneration. There are several 10- to 15-story apartment buildings with laundry hanging in a few of the open windows. But most of the windows have broken shutters covering them, or are obscured by bikes, strollers and boxes on the small balconies. The buildings are connected by concrete open spaces and “plazas,” which once might have been perfect architectural drawings in some bureaucrat’s office, but are now mini-wastelands of broken concrete slabs, windblown debris and weeds pushing up through the cracks. The few once-green spaces were long ago transformed into dry packed dirt or muddy soccer fields, depending on the season. Once there were small stores, a medical center and municipal and social service branch offices, which contributed to the development of a strong social fabric. In the last ten years almost all have quit the area, either due to vandalism and theft or to government cutbacks, which inevitably come at the expense of these outlying neighborhoods. Thus the residents no longer have at their disposal the commercial, social or medical services necessary for any but the minimum necessary to survive. In addition, since public transportation has also been reduced to a minimum, and most of the residents do not own cars, the bare minimum is indeed what many of these people seem to live on. But more than the run down nature of the place and the absence of public facilities, what struck me most when I went outside to buy some crackers for use as props, was the total absence of life in the midst of the several thousand families living here. In spite of the sudden appearance of children when school let out in the afternoon, the place is soulless. During the day these zones are empty. The emptiness is palpable, and stands in stark contrast with my memories of the bubbling life of the Aida refugee camp in Palestine, from where the Al Rowwad troupe has come. The innumerable little stores seemed to never close, selling anything and any service one could possibly need to live a normal life. There were people of all ages on the narrow streets and passageways at all times of day and night, bidding each other hello as they went on their determined ways. I do not mean to minimize the intolerable nature of the political and historical existence of the refugee camps. But if Aida and the Valdegour neighborhood are any example, at least on the level of human relationships and the social fabric, I vastly prefer Aida. When there, I felt safer and more welcome. I found the environment more stimulating, more varied, more accessible and certainly more useful. Perhaps even more importantly, I found the residents of Aida to be far more conscious of their situation and of the forces that control their lives. As a result, they are far better equipped to deal with their daily existence than the residents of Valdegour. The residents of both places are the victims of the same contemporary social and economic forces, and I am not always sure that the Palestinians are worse off. Lodeve, 23 June I am finishing this essay to the sounds of Palestinian and French songs sung by the troupe and several of the local welcoming committee on the porch of a chalet situated up in the Mountains Noirs in the south of France. There are several who can play guitar, and the music is nostalgic and sounds good. We are long from Aida and Valdegour and the inequalities and injustices that have created them. Tonight this is a special and poignant moment. In a just world this evening would be just another banal encounter with some exotic tourists. Canaan is the 11-year-old son of Abdelfattah Abousoud, the author and director of “Handala,” and founder and director of the Alrowwad Cultural Center. I met him 4 years ago when I spent two weeks in the Aida refugee camp. Then, he was already a street-wise kid, quiet and deep. Now, 4 years later he is not so quiet, so his depths are more evident. He is an amazing child, partly because he has not had a childhood, as we know it. He has been both condemned and blessed: condemned by the physical deprivation of life in a refugee situation and by the almost total lack of freedom of movement beyond the very limited space of Aida and southern Bethlehem. Blessed by being the son of Abed, a man of exceptional creative talent, but even more a man of peace and understanding in a situation that one would think would solicit anger and a closed mind. He brings creativity and non-violence to the struggle for justice and a Palestinian state. So, Canaan has developed an understanding of his situation and is being given the tools with which to deal with it in creative, forceful and positive ways. The result is a young man (alas, already), cleaver, direct, sensitive and capable of dealing with unpredictable situations. Wataan I do not know. 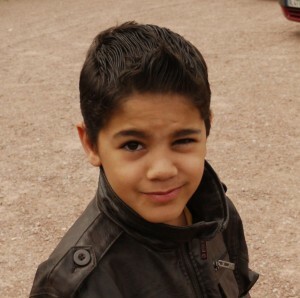 He is the two-year-old son of Tareq Aljawabra, one of the actors in the play and a member of the staff of Alrowwad. I mention Wataan because in conversations, his father has expressed his hopes and desires for his son, and talks about being with him and how they are together. Tareq is more conscious of his responsibilities as a father than I ever was. Maybe bringing up your kids in a war zone makes you that way. I sense with Tareq the same commitment to raising his son to be dedicated to the Palestinian cause in a profound and peaceful manner, as I see with Abed and Canaan. Early on in the tour we were walking to a picnic site and passed a green and well-equipped football (soccer) field. Tareq looked at it and commented on how Palestinian kids have to play on empty dirt lots or in the streets. He hoped that one day Wataan would be able to play in green fields, as free as any “normal” kid in France or elsewhere. There is something else which brings these two children together in my mind, and that is their names, both of which refer to the land, which is Palestine. Canaan is a direct reference to “the land of Canan” of the Old Testament. Wataan, in Arabic, means “homeland.” So, both of these kids are named in honor of what Palestinians want most, and what their struggle is all about: their own land and their own identity and the dignity and rights that go with it. My experience on this trip confirms one of the things that struck me four years ago when I visited the Aida refugee camp, and that is the nature of the Palestinian struggle. For years the popular media has been presenting Palestinians as being anti-Israel, unwilling to recognize her right to exist, and ready and willing to undertake whatever actions are necessary to destroy her, including and even especially terrorist actions. But for the vast majority of Palestinians this image, this supposed posture is simply not true. The average Palestinian is not interested in destroying Israel. In fact, most Palestinians have more or less the same attitude about Israelis as people in the US have about Canadians; they are indifferent as to what goes on inside Israel as long as they can lead their own lives in their own country. What Palestinians want are their own land and their own self-determination. There is nothing radical about this; it is not a “terrorist” project. Having your own land – coming from somewhere, is an intimate part of who we are, as much so as the language we speak. It is what most of us have and take for granted. The naming of their children after the homeland that has been taken from them is a way for Palestinians to maintain both the reality (imperfect) and the dream of the fulfillment of their existence as a people with a land. The reality in the form of the presence of the actual living objects of the word, the name: Canaan, Wataan – Homeland, and the dream – the never-ending possibility of a real homeland, in the form of each succeeding generation, which in its birth gives ongoing hope. In the face of the struggle and determination of parents like Abed and Tareq, and of children like Canaan and eventually Wataan, I realize how untenable is my easy and privileged cynicism. The imperative to help their dream come true imposes itself both for their sakes and for mine.